I’ve already fallen in love with custard cornbread, but with Thanksgiving just around the corner, I figured I needed a really great traditional, buttermilk cornbread recipe up my sleeve. I tried Grandmother’s Buttermilk Cornbread from All Recipe which boasts over 3000 five star reviews, All-Purpose Cornbread from Cook’s Illustrated 20th Anniversary Best Recipes Cookbook, and Perfect Cornbread from Little B Cooks. I fed them all to my family and friends alongside a piping hot bowl of tomato soup, and there was a clear winner. In past Recipe Showdowns, I have been a bit frustrated by the fact that often there isn’t a clear winner. In the past, both of the recipes are so good, it’s really unfair to put one above the other. One of the ideas behind Recipe Showdown is that I can “test-drive” the most popular recipes, so that you don’t have to. For example, let’s say your friends ask you to bring cornbread to a holiday get-together. You won’t have to waste ingredients trying all the recipes, or risk serving something less than delicious to your friends, since I’ve done all the dirty work for you! 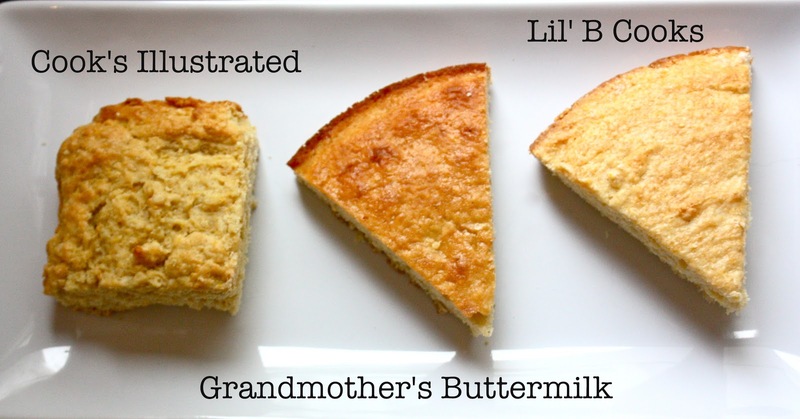 In this showdown, Grandmother’s Buttermilk Cornbread was a clear winner over All-Purpose Cornbread. It has a nice, crunchy, golden brown top and a sweet, flavorful texture. All-Purpose came up short with an overly crumbly texture and a chunky, pale exterior. However, Perfect Cornbread boasted some pretty great health stats (1/3 cup coconut oil over a whole stick of butter!). Perfect Cornbread also had a nice texture which would satisfy all (not as cakey as Grandmother’s, and not as crumbly as All-Purpose). I also loved the slight hint of rich coconut flavor in Little B Cooks’ recipe. Healthy, perfect texture, and delicious? Looks like we have a winner! As always, feel free to challenge the winner with your own delicious cornbread recipe! stews… especially chili. I love how cornbread is the perfect marriage of sweet and savory — with crumbly, fluffy texture and sweet, buttery flavor in every bite. Why mess around with something so simple and perfect? This recipe is the most simple, straight-forward, fool-proof cornbread recipe out there. It’s delicious, so why fuss with it? I picked up a bag of blue cornmeal on my service trip to Santa Fe, so this loaf brought with it many memories from my unforgettable trip. Blue corn is also known as Hopi maize and is grown primarily in the Southwestern United States. It is an essential ingredient in New Mexican cuisine. In addition to a beautiful, vibrant color, it has several nutritional perks as well — having 20% more protein and a lower GI than white corn. It also has a sweeter, nuttier taste. blue cornmeal — all the way from Santa Fe! I love to eat my cornbread with a big pat of coconut butter and a dollop of honey, and watch as the big, soft crumbs soak up the sweet, velvety goodness. This cornbread is exactly how I like it, crispy on the outside with a moist crumb inside. Do you ever take ingredients home as souvenirs? Preheat an oven to 350 degrees F (175 degrees C). Grease a 9×9 inch baking dish. Mix cornmeal, flour, baking powder, sugar, and salt in a bowl. Sift 3 times. Stir the eggs and milk into the cornmeal mixture. makes a great quick breakfast or snack when warmed in the microwave!